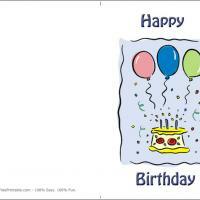 If you are looking for cute and colorful themed free printable cards for your son, try this birthday card. It has an image of a happy dog in a light blue and green background. These printable birthday cards are surprisingly ornate in their design as it doesn't just feature a puppy, but also plenty of greenery, a lovely fence, and a paneled walkway, plus a green watering can. It's an all around pastoral scene that is perfect for birthdays. 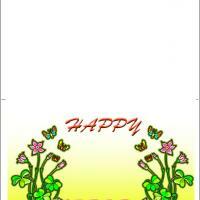 Just print this and fold it in half then write your birthday message to your kid. He will surely love it. This little puppy is waiting patiently by the gate just wish somebody a sweet birthday greeting. He has a beautifully marked coat of fur in black, brown, and white. The handsome pup is sitting in front of an ornate gate with a manicured lawn dotted with pink flowers in back. 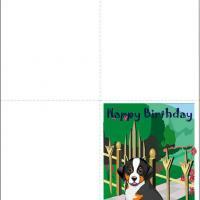 Happy Dog Birthday Card with its eye-catching details is the norm quality of these free printable birthday cards. Attention to detail and color combinations make our cards extremely popular for printable cards. 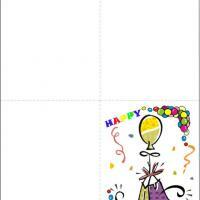 With a click or two text or clip art can easily be added before you print these cards at home. It sure is a pleasure to arrive home and be greeted by our pets. That is why lots of folks on your birthday card list will appreciate Happy Dog Birthday Card being in their mailbox to greet them with a warm birthday wish. The card is handsomely designed with a beautiful dog sitting in front of a gated walkway. The lawn is waiting for him and his owner to take a walk. Take a walk through these free printable cards and you will have plenty to send to everyone on your list. 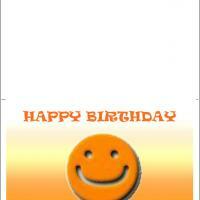 Our easy custom print feature allows you to personalize the birthday greetings with images and words of your choice.